The picture defines my six months stay in Chennai in the year 2003 for my Engineering project work. Ever since I watched the movie Alaipayuthey during my college days, my dream was to go to Chennai and fall in love with a girl in the railway station. After coming to Chennai , I had spent many days in the same spot where Madhavan is standing in the above picture. I have the same red T shirt and Black Jean trousers and a coolers that I bought for Rs 100. But not even a single girl turned her attention towards me at that time. 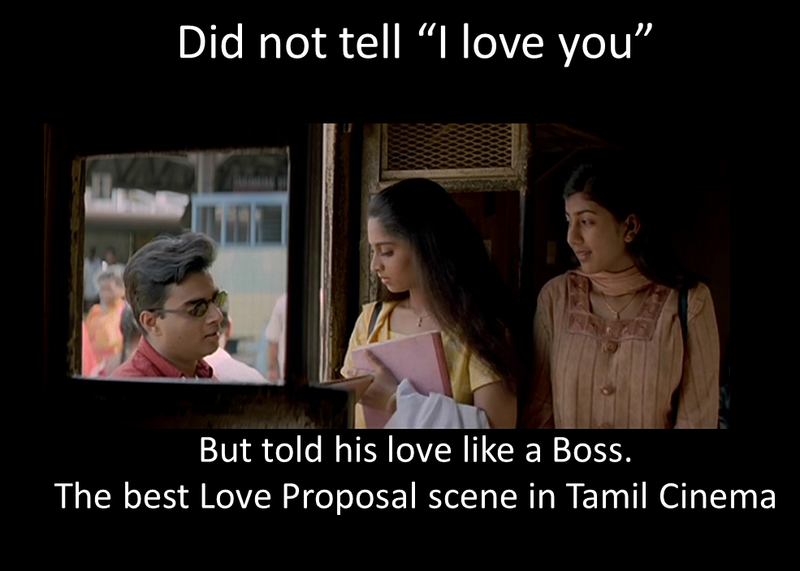 The movie Alaipayuthey was a cult hit at that time and all of us wanted to be like Madhavan. We all knew "The love proposal scene" by heart. But I never had the guts to do what he did there. I stayed in Tambaram and every evening I would board the train from Tambaram railway station. Her name was Neelima. She used to board the train from Chrompet station. That's how I figured out that she was a student of MIT college in Chrompet. I would see her getting into the same compartment everyday and made sure that I was also in the same compartment that she got in. The first few days, she did not even notice me. But as she was smart, she found out that I was following her everyday. Some days I will hide in the compartment and she would search for me and aftersome time I would emerge out from no where and give a supposedly romantic smile at her and she would put her face down. One day, I gathered up all courage and went and stood near her. She got scared a little bit. I was among the very few people who had a mobile phone in 2003. I took the mobile phone and showed off. I knew I got the attention I needed. I played some ring tones ( monotones) and she enjoyed it. Soon it became an every day habit for me to stand next to her. She would smile at me and I would smile at her. But I did not gather any courage to speak to her. I would play the Snake game on my mobile phone and she will watch me play the game over my shoulder. "Can I also play? ", I heard that sweet voice caressing my ear drums and that floored me and the next minute, my mobile phone was in her hands and she started to play using the mobile phone. When I came back to reality I decided to talk with her. "Chriz! What do you do?" " 2nd year CSE at MIT. What about you?" " Final year EIE from Pondicherry. I am here in Chennai for my final year project"
"Yes, Project in Nungabbakam. Where do you stay?" " I stay in Egmore Police Quarters "
Is she a Police man's daughter? I had shivers down my spine. I went silent. She gave me "Why so silent look" and said "My Dad is the SP of Chennai". This was the precise moment I literally peed in my pants. My alter ego told me not to get too intimidated by what she said. I closed my eyes and imagined what and all would happen if her dad catches me. I felt someone patting my shoulder. I still kept my eyes closed. "Is Neelima touching my shoulder?". I felt so good. I still kept my eyes closed hoping she would touch me again. Suddenly she Kissed me on my cheeks. I was shocked and opened my eyes. What I saw petrified me to the core. I was surrounded by three eunuchs and one of them said, "Why are you acting as if you are sleeping. Give us money". Out of fear, I immediately gave them some money. I looked to my left and Neelima started to laugh at me. When the eunuchs left the place, she said ,"Anna, You are so lucky". That was a heartbreaking statement for me because she called me Anna (Brother in Tamil). I took the mobile phone from her hands and got down at the next station and walked away slowly with tears in my eyes. It has been 11 years now and even now when I travel in an electric train, I remember that incident as if it happened just yesterday. The Eunuchs still terrorise us even today. I do not know what happened to Neelima. I never saw her again. "I stay in Egmore Police Quarters" "My father is the SP of Chennai" Something is amiss here. Glad you only had a crush on Neelima! 668. How will you celebrate Independence day?